Dog Harnesses for Asian Shepherd - the Finest in UK! 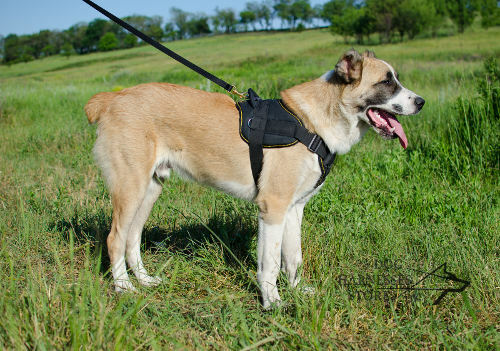 Our online dog store offers leather dog harnesses and nylon dog harnesses, which were designed specially for Central Asian Shepherd daily activities. High-quality, robust and exclusive dog harnesses will give supreme comfort, safety and reliable control under your strong dog! Special offer for Central Asian Shepherd owners! Use the coupon code 5577 for 10% discount for any dog accessory for your dog! Central Asian Shepherd (Central Asian Sheepdog) is a representative of guard dogs, which was bred in Central Asia and now is becoming popular all over the world for its bravery, courage, strong guarding and territorial instincts and loyalty. These dogs are the ideal guardian dogs, because they defend their family and home to the utmost. Moreover, Asian Shepherds are very smart and sensitive, relate well to children. Central Asian Shepherd is a large dog with great power and strength, that`s why not all dog equipment is suitable for such a strong dog. These dogs need special super durable, very comfortable and custom made dog gear that will resist hard dog pulling, won`t hurt the dog and would be made according to the body structure of the Asian Shepherd. 1. Very nice harness. We are glad we found this light-weighted harness for summer. The dog walked around all proud of his new harness. Thank you!